President Trump watches as GOP congressional candidate Rick Saccone speaks briefly at a rally in Moon Township, Penn. Reprinted from The Washington Post by Greg Sargent on March 12, 2018. 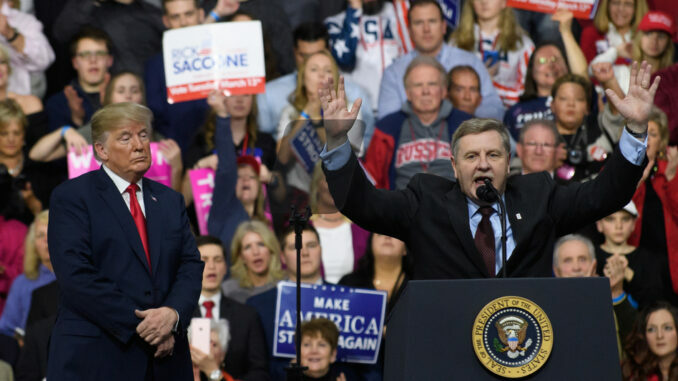 “Prediction: If Republican Rick Saccone scrapes out a close win in tomorrow’s special election for a House seat in southwestern Pennsylvania, Donald Trump will claim it was all because of Donald Trump,” writes Greg Sargent in The Washington Post. “But if Saccone falls just short, Donald Trump will claim it was all because Saccone didn’t sufficiently emulate Donald Trump.